A new database of information on food ingredients will help clarify the fuzzy boundary between food supplements and herbal medicines across Europe” is the headline of a recent post of the Europe Research Media Center. In this article, Institute of Food Research (UK) scientist Paul FINGLAS explains the value of the database being developed and how it will pool together the existing knowledge on the beneficial and adverse effects of bioactive compounds in supplements. The database is one of the EU fundedPlantLIBRA project’s main outcomes and it will define a consistent set of references for bioactive ingredients for all member states, where presently the categorisation between plant food supplements and traditional herbal medicinal products varies between countries. This is particularly important for imported plant food supplements that need harmonized regulation to improve quality and consumer safety. In this sense, PlantLIBRA is taking an appropriately broad strategy in analysing all relevant aspects of the research needs for the science and regulation of botanicals, such as intake and consumption patterns, supplement composition and analysis, and the evaluation of benefits and risks. Hylobates is one of the project partners currently working on the risk-benefit assessment of plant food supplements for an improved science-based decision making approach. The paper presents the consortium’s plan for improving the science of botanicals and risk and benefit assessment methodologies for plant food supplements (PFS). In this 4 year project, partners are working to expand and generate knowledge on PFS through systematic reviews, intake surveys, new studies on benefits, risks and new analytical findings to ultimately ensure a safer use of PFS by consumers. By doing so, they plan to address data, methodology and consensus gaps in cooperation with different stakeholders and decision makers in the PFS sector. An improved risk- benefit assessment of plant food supplements, as investigated in the project PlantLIBRA (this part of the work is led by Hylobates and Dr. Antonella Guzzon as work package leader), is motivated not only by the needs of better science and regulation in this sector, but also by the clear sales increases worldwide. In 2010, for example, the plant food supplement, or with US terminology herbal dietary supplement (DS), market in the USA increased by an estimated 3.3 percent in all channels of retail trade, as reported in the HerbalGram Herb Market Report of the American Botanical Council. The robust growth in the herb market seen in recent years reflects the increasing consumer interest in good nutrition and natural lifestyles. The report discusses this growth and the complexity of doing total sales analysis of this segment. For instance, the degree of increase depends widely on the source of the sales information and the data collection parameters (inclusion of combination herbal dietary supplements with primary ingredients, for example). Sales growth data analysis from the Mainstream Food, Drug, and Mass Market (FDM) channel (drugstores, grocery stores, mass market retailers, et al., but not including Wal-Mart) is lower as when buyers’ clubs and convenience stores, including Wal-Mart, Sam’s Club, Costco, et al. are also considered in the FDM channel. The report includes the 20-top- selling herbal dietary supplements in the Food, Drug, and Mass Market (FDM) channel in the United States in 2010. 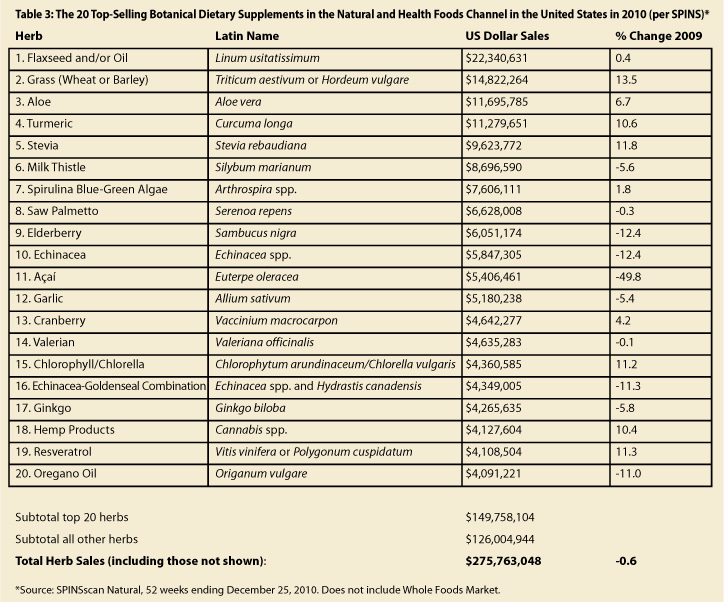 According to the authors, the list shows the trend of consumer interest in many relatively well known herbs due to a growing body of scientific and clinical research conducted on them. These include, as noted in order of ranking: cranberry, saw palmetto, garlic, ginkgo, echinacea, milk thistle, black cohosh, Asian ginseng, green tea, etc. This ranking (see table below) also shows several plants that are investigated within PlantLIBRA´s different research groups, and reflect as well some trends in the European plant food supplement market. Regulators from 19 European countries, from China and the USA, debated with PlantLIBRA’s (PLANT food supplements: Levels of Intake, Benefit and Risk Assessment) project partners on outcomes and strategies to tackle priorities in the science of plant food supplements. The discussions took place during PlantLIBRA’s first Policy Advisory Board (PAB) meeting held last 27th and 28th of September in Brussels. Francesco Carlucci of the EC Directorate General for Health and Consumers, who attended the meeting, expressed that the DG Health and Consumers is following the research project with interest and that discussions within the Directorate are ongoing on health claims on botanicals. PlantLIBRA is investigating the benefits of botanicals. Another of the project’s outcomes, a meta-database being developed for plant food supplements, was presented and raised great interest among participants. PAB chairman Mr Joris Geelen of Belgium’s Federal Public Service (FPS) noted the database’s value for experts and policy makers dealing with quality assurance and assessment of risks and benefits of plant food supplements. Furthermore, the board’s members asked for clearer guidelines to interpret scientific evidence on botanicals. Catherine Ecclestone from the EC’s Research Directorate also participated in the meeting. With this fruitful exchange, PlantLIBRA researchers continue progress to facilitate science-based decision-making in the area of plant food supplements in the interest of consumers. The event was hosted by Belgium’s FPS, and organized in cooperation with the European Botanical Forum, the international food consultancy EAS and Hylobates Consulting, who are partners of the PlantLIBRA’s project. Hylobates scie ntist Dr. Antonella Guzzon presented the proposal of risk-benefit approach for plant in food supplements during PlantLIBRA’s first Policy Advisory Board (PAB) meeting in Brussels from the 27th to the 28th of September. In this event, project partners discussed with policy regulators on the approaches to facilitate science-based decision-making in this area. Dr. Guzzon presented the approach in progress which, based on existing approaches for risk- benefit assessment, proposes to develop a framework for assessing the strength, consistency and biological plausibility of the evidence of the benefits and risks plant food supplements. Within this framework, to each kind of evidence (in vivo evidence, tradition of use, animal and human evidence) related to a specific claimed effect for a certain plant food supplement a category (from convincing evidence to insufficient) would be as attributed. This should enable the risk assessor to make a statement on the result of the risk-benefit assessment, i.e. whether risks or benefits are dominating, explained Dr. Guzzon. Additionally, the model considers prior beliefs on the existing scientific knowledge on the botanical and how new studies and data can change those prior beliefs. Finally, in order to make the process transparent, all these steps will clearly described, In this sense an open web source accessible to everybody and therefore exposed to open criticism, will be used to develop the model for risk-benefit assessment of plant food supplements. Leading scientists of PlantLIBRA (PLANT food supplements: Levels of Intake, Benefit and Risk Assessment) are meeting today with policy regulators of 19 European countries, from the European Commission, from China and from the United States. The meeting will take place in Brussels on the 27th and the 28th of September. Researchers will present project progress and expected outcomes, while hearing from policymakers how they can help facilitate science-based decision-making in this area. Plant extracts have for centuries provided health benefits to consumers. The use of botanical ingredients, while growing across Europe and worldwide, is facing uncertainty in both regulation and science which may limit its future development. PlantLIBRA has brought scientist together in order to provide more data, knowledge and an enhanced science-based decision-making framework to assess benefits and risks of plant food supplements, with the ultimate goal of benefiting consumers. The event, which is not open to the public, is PlantLIBRA’s first Policy Advisory Board (PAB) meeting. It is hosted by Belgium’s Federal Public Service (FPS) Health, Food chain safety and Environment, and organized in cooperation with international food consultancy EAS and the European Botanical Forum, partners of the PlantLIBRA’s project. Mr Joris Geelen of Belgium’s FPS Health is the chair of PlantLIBRA’s PAB. Hylobates Consulting of Italy, another partner of PlantLIBRA, will present progress in the development of risk-benefit assessment methods for botanicals and discuss with participants the best approach to improve regulatory decisions about plant food supplements in the European Union. PlantLIBRA (acronym of PLANT food supplements: Levels of Intake, Benefit and Risk Assessment) is a project co-financed in the context of the 7th EU Framework Program. It began in June 2010 and represents a consortium from four continents, made up of 25 universities and public research institutions, small- and medium-sized enterprises (SMEs), industry and non-profit organizations. PlantLIBRA partners (PLANT food supplements: Levels of Intake, Benefit and Risk Assessment) are preparing to meet in Brussels the 27th and the 28th of September with policy regulators of 19 European countries, and authorities of China and the USA, to present project progress and discuss outcomes and on-going activities. Project goal is to provide EU and national policy regulators with an enhanced science-based decision-making framework to evaluate and assess benefits and risks of plant food supplements. The first PlantLIBRA Policy Advisory Board (PAB) meeting will be hosted by Belgium’s FPS Health, Food chain safety and Environment, and is organized in cooperation with the European Advisory Services (EAS), one of PlantLIBRA partners working on the project’s policy implications. The event will promote discussion on plant food supplements between actors of policy and science. The actors of the regulatory field will learn from the expected outcomes of the project and through this exchange, the PlantLIBRA researchers will also be able to get the needed insights for the elaboration of adequate methodologies and accessible databases for an improved risk benefit assessment specific to plant food supplements.